If you are anything like me, you’ll do anything to avoid the registry at Babies “R” Us when that baby shower invitation comes in the mail. I always figure that someone else will gift the essentials and I like to have a little fun with my gift. 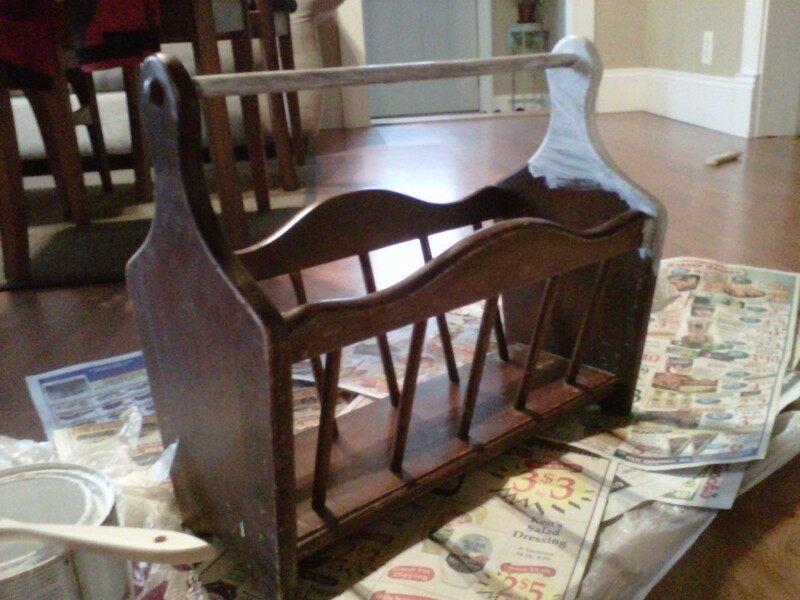 My favorite baby gift as of late is a hand-painted magazine rack. Once painted, I fill it with an assortment of baby books and the latest magazines for the mother. I envision the magazine rack next to the glider in the nursery, full of entertainment for those late-night feedings when the Facebook feed leaves little to be desired. First, you need to get your hands on a magazine rack. The unfinished furniture stores sell a decent one that I’ve used in a pinch (it’s also kind of pricey and I like to spend that money on the books and mags) but I prefer an old cast off such as this one I found in someone’s trash during one of my morning runs (Note to mother: I cleaned and scoured this baby before painting, I promise!). It is well built and sturdy so I know it will stand up to children.. I couldn’t believe how perfect this was when I found it! Other than a few small repairs, it was ready to go. I gave it a very light sand and then primed the whole rack with Kilz primer. I allowed the primer to dry for at least a day and then followed it with 2 coats of a flat white paint. Once that was dry, I distressed the piece a bit. Because this gift was going to a first-born baby girl, I wanted to do something that was subtly feminine but otherwise gender neutral. I decided to go with an animal theme because it’s always a hit with kids. I found a few great images of elephants online and merged them together to make my own version. I drew the elephant out on paper and then cut it out with fingernail scissors (easy to use for small cuts). 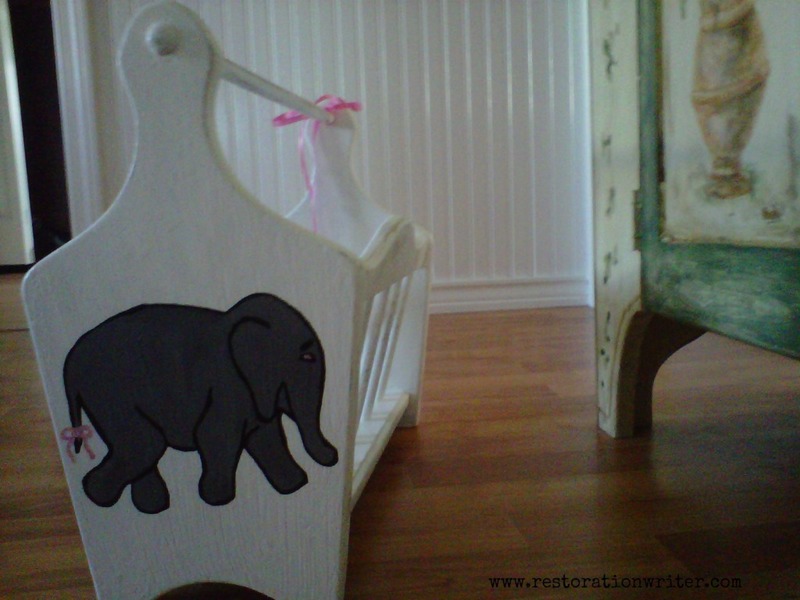 I traced the elephant on to the end of the magazine rack and then filled it in with paint. I used a black Sharpie marker to outline the elephant and to make a few distinguishing marks. Then I added the pink bow to the tail. Last week I found a similar magazine rack at a thrift store for $3 so I can’t wait to receive my next baby shower invite!